For a few years now, every time I passed by Barrio Chino overflowing with hipsters I assumed the worst; fake Mexican food for posers. Trendy and tasty don’t usually go hand in hand. However, after hearing from friends fawning over the place over and over again, I decided it was about time to walk those three blocks over to Broome. Every restaurant deserves a shot in my book/blog/stomach, even the pretentious ones. As expected, Barrio Chino (Chinatown in Spanish) tries very hard to assume the bohemian charm of most restaurants in the Lower East Side. There is exposed brick, tiny tables spaced just short of shoulder to shoulder contact with your neighbor, a drink menu on a piece of cardboard borderline scary to touch, and precarious lighting in the bathroom that will initially cause alarm when you have to feel your way out when the light goes out mid pee. However, surprisingly, it works because the food is actually good and their margaritas are killer. David and I started out with the Guacamole Y Totopos ($8), chunky guacamole with diced tomatoes and thick fried tortilla chips that crunch loudly with every bite. Accompanying the guacamole was also a little bowl of spicy salsa made with roasted tomatoes. The intense taste of roasted tomatoes went well with the fresh guacamole. Guacamole is easy to make, but restaurants often screw it up. Barrio Chino, luckily, does not. 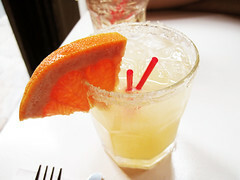 To drink, I got the Grapefruit Habanero Margarita ($11). I scoffed at the waitress’ warning about the heat when I ordered the drink. ‘Pish posh,’ I thought, ‘I’m Korean.’ But after a sip that pumped liquid habanero straight into my bloodstream, it became obvious. The bartenders at Barrio Chino mean business; the Grapefruit Habanero Margarita is muy caliente! After that, I decided to wait until the ice melted a bit before taking another sip. I needed to save my taste buds for my main course, the Barbacoa. 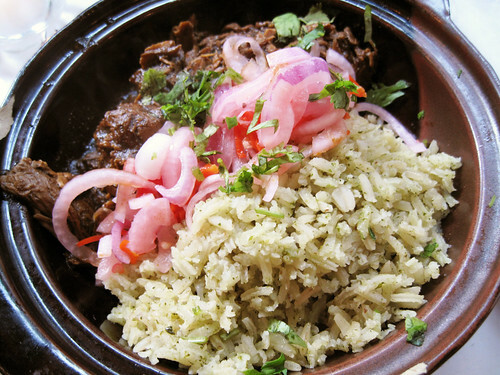 The Barbacoa ($15), “shredded lamb made with pasilla chile salsa, served with green rice, pickled habanero onions, and tortillas” was brought to the table by our waitress with a flourish as she sang “Bar-ba-CO-AH” à la Heart in the song “Barracuda.” (Or at least she did in my mind.) The lamb was cooked tender but was wanting in the spice department. I thought of asking for more salsa, but considering the powerful cocktail I was drinking, I decided against it and made do alternating bites of lamb wrapped in tortilla with sips of my cocktail. It actually worked out, strangely enough, because the citrus in my cocktail complemented the lamb. The pickled habanero onions, while oddly more sweet than spicy, also paired nicely, but I wish there had been more of it. The rice, on the other hand, was a little too soft. I like my rice to have more texture. David had the Nopales, Betabel, Y Aguacate ($8), “mixed greens, cactus, beets, avocado, and queso fresco, in a balsamic vinegar, citrus and olive oil dressing” as his main. David loved the tart cactus. I had a few bites of his salad, and it was fine, except there were a few leaves that had seen better days. Wilted greens in a salad is a pet peeve of mine, as some of you may know. I stuck to my barbacoa. It was my first visit to Barrio Chino, but definitely not my last. While everything wasn’t perfect, the Mexican flavors were spot on and the margaritas don’t mess around. Not easy to come by in my hood, no less barrio chino. OMG definitely one of my fav. restaurants. a pretty big deal since i don’t even like mexican food. i took a sip of someone else’s habanero margarita after not believing their cautions and i literally choked. @Janet – Yes, definitely let’s! @kim – I wasn’t excited about the salad enough to take a pic. I will next time! très appétissant. 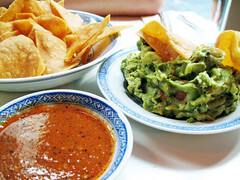 the best guacamole I ever tasted was in Chili, with incredible avocados. Fresh and juicy. 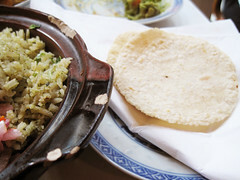 @la flore et la faune – I wonder if Chilean guacamole is different from Mexican guacamole. And yes, the quality of avocados make a world of difference. @Wonders – Who would think people would be interested in salad pics?! More salad pics in the future!! FYI: Go early, and preferably on the weekend. Last Fri there was 1.5 hour wait!